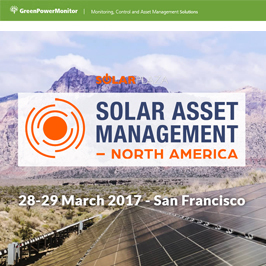 GreenPowerMonitor will attend as an exhibitor sponsor the 4th edition of the Solar Asset Management North America conference in San Francisco where DNV GL will be a Gold Sponsor. Our experts will be pleased to discuss and demonstrate the value our solutions can add to your PV assets through our controls, performance monitoring, portfolio management and O&M tools. Tor Blackstad, CEO of GreenPowerMonitor Corporation will attend the event as a featured speaker at the panel “KPIs: What solar can learn from industries”, alongside Ann Walter from EDP Renewables North America and Andrew Griffiths from Recurrent Energy. Please, do not hesitate, stop by our #22 booth or DNV GL’s #13 booth or contact us through peter.kobliska@greenpowermonitor.com to schedule a meeting. Also, let us know if you are not planning on attending this year’s Solar Asset Management North America. We would love to schedule a face visit with you at your office following the show.